So I made a run to Whole Foods recently, since I had an hour to burn. I spent WAY too much money there (you'll find out on what in a future entry), and one of the things that contributed to that was this yogurt. 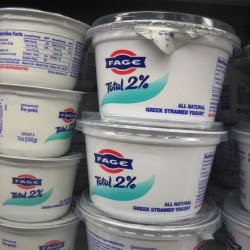 I've heard so many things about Fage (pronounced: fah-YEH) and finally decided to give into the hype. For $1.89, I was thinking, "It better be good!" I got this 2% kind, because the 0% next to it weighed less, ha ha. The 0% has 80 cal and 13 g protein, and the 2% has 130 cal and 17 g protein (the "whole" has 200 cal and 20+ g protein). But yeah, after a 6-mile run, I didn't want to settle for the weenie one, especially if I was paying $1.89 for it. Okay, enough gripes, I guess. So I cracked open this baby in my car and tried to poke at it, only to find it is covered by parchment paper. After getting through that weirdness, I tasted what was the creamiest yogurt ever. I sometimes get a carton of plain low/non-fat yogurt, but this was just, as my classmate says, "bomb." It is everything I like in plain yogurt and a very good protein source. Yes, I am on a protein trip lately. I find that eating more of it helps me heal up better after runs. Stay tuned for more protein-rich food reviews. Three races. One special medal. One friend who talked me into it. One heck of a challenge. I guess this means my race plans for next year are changing. And the traveling will be nice.